SHS Bihar Notification is out. SHS Bihar is recruiting for 03 Director Post Posts. 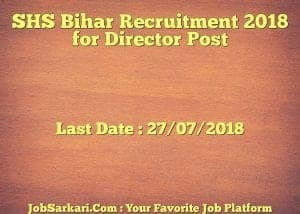 You can check SHS Bihar - State Health Society Bihar last date, download SHS Bihar notification, visit SHS Bihar official website and check other SHS Bihar Vacancy details.Complete Vacancy and recruitment Details about 03 Director Post vacancies in SHS Bihar are provided below by JobSarkari.Com only for you. Last Date for Apply Online 27/07/2018. Additional Director - PPP Candidate Must Have Passed MBA in Public Health Management / Hospital Administration and Master in Public Health With Two Years Experience. 01. Assistant Director - Legal Candidate Must Have Passed LLB With 50% Marks and Enrolled as an Advocate With 03 Years Experience of Handling Legal Matters. 01. Assistant Director - Referral Transport Candidate Must Have Passed MBA in HR / Marketing / Transportation & Logistics Management / Transportation Management With 01 Years Experience of Operating Mortuary Vans. 01. Total No of Post 03. Maximum Age as on 01/06/2018. BC / EBC (Male / Female) / UR (Female) 40 Years. SC / ST (Male / Female) 42 Years. 4.Upload the Scanned Copy of Required Documents in Prescribed Size. 6.Online Application Can be Submitted on or Before 27th July 2018. Q. 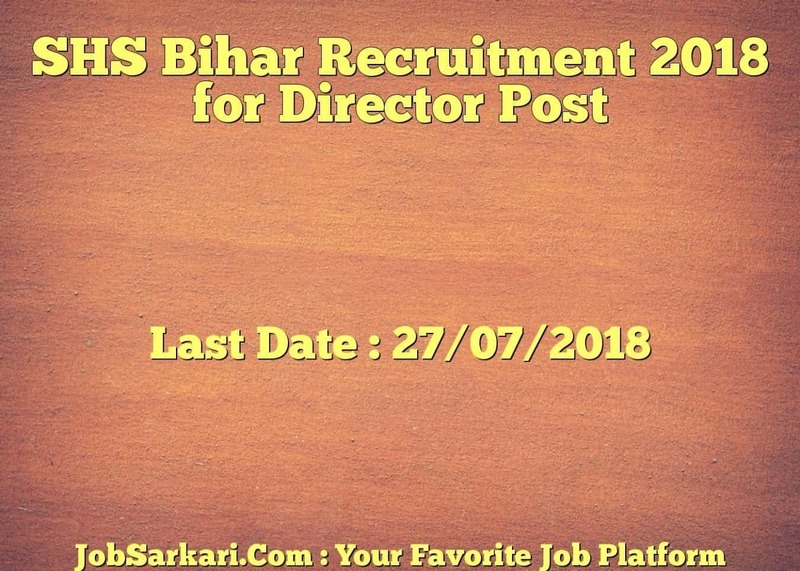 What is the Last Date For SHS Bihar Director Post Vacancy ? A. Last Date for SHS Bihar Director Post Posts is 27/07/2018. Q. What is the Form Type of SHS Bihar Director Post Recruitment ? A. The Form Type for SHS Bihar Director Post Posts is Online. Q. How many vacancies are available in State Health Society Bihar Director Post Posts ? A. There are about 0 Vacancies in State Health Society Bihar Director Post Posts. Q. What is the Full Form of SHS Bihar ? A. Full Form of SHS Bihar is State Health Society Bihar .